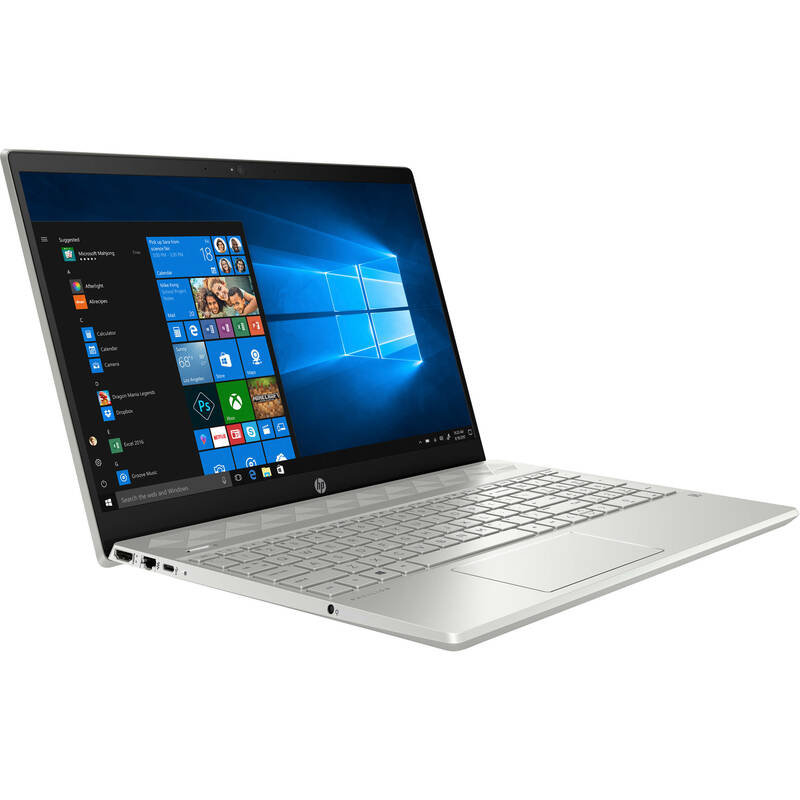 The 15.6" Pavilion 15-cs2010nr Multi-Touch Laptop from HP is designed to provide powerful performance that can deliver throughout long workdays. The system is powered by a 1.6 GHz Intel Core i5-8265U quad-core processor, which allows you to run multiple applications simultaneously. If you need more power, the system can be overclocked to 3.9 GHz. The 8GB of 2400 MHz DDR4 RAM helps to ensure smooth multitasking and also allows the computer to quickly access frequently used files and programs. For storage, the Pavilion laptop is equipped with a 256GB PCIe NVMe M.2 solid-state drive. There's also an integrated HP Wide Vision IR webcam and dual-array digital microphone, so you can video chat when you need to. The 15.6" SVA BrightView display features an HD 1366 x 768 native resolution, WLED-backlighting, and a 16:9 aspect ratio. The display also features micro-edge touchscreen functionality, which allows you to utilize the touch gestures and functions in Windows 10 to further improve accessibility and productivity. The integrated Intel UHD Graphics 620 chipset delivers a sharp, clear picture. You'll also be able to output video to an external display using the system's HDMI 1.4 output. Other connectivity options include one USB 3.1 Gen 1 Type-C port, two USB 3.1 Gen 1 Type-A ports, one multi-format SD card reader, one 3.5mm headphone/microphone combo audio jack, Wi-Fi 5 (802.11ac), Gigabit Ethernet, and Bluetooth 4.2. HP's 15.6" Pavilion 15-cs2010nr includes a 45W AC power adapter and a 3-cell / 41Wh lithium-ion polymer battery. The installed operating system is Windows 10 Home (64-bit). Multitasking feels easy and fast with a quad-core 8th Generation Intel Core i5 processor. Watch videos, edit photos, and connect to family and friends with all the power you need to get things done. With dual HP speakers, HP AudioBoost, and custom tuning by the experts at B&O PLAY, you can experience rich, authentic audio. Let the sound move you. Upgrade performance with smooth system responsiveness and fast load times for an enhanced computing experience. It supports HD resolution, so you can stream premium content or even create your own. Designed to run efficiently and reliably at fast speeds, the 2400 MHz DDR4 RAM module has a high bandwidth for multi-tasking and game play. Grow your digital collections and still have room left over with up to 256GB PCIe NVMe M.2 solid-state drive storage, which is up to 17 times faster than a traditional 5400 rpm laptop hard drive. Smoothly stream HD content and play your favorite games in 720p, without the need for dedicated graphics card. With robust graphics performance, you'll see the difference in everything you do. If you aren't already a member, sign up for Dropbox and get 25GB of storage for 12 months to save and access your photos, documents, and videos.